Many creators face a dilemma when it comes to their careers. It often seems to be passion versus income. Allowing creators to create, unbridled and free from distraction, to reach for their dreams, enables them to spread their message of inspiration and, hopefully, light. What I have always wanted is a close-knit community whom I can call friends, who share the same kinds of dreams and goals that I do; who cherish and support not only me, but also each other. In this ideal community, I can give back by being a friend. I can share more of myself than I ever do elsewhere. I can give tons of gifts, surprises, bonuses, tips, references, and whatever else might be enjoyable and helpful, not out of obligation, but out of gratitude. Patreon creates the perfect place to do that. Patreon is more than a monthly tip jar. It is a platform for fans and creators to connect in a personal way. Similar to Kickstarter, you can pledge a certain amount to support what you believe in, and receive specific perks or rewards as thanks. The difference is that with Patreon, the support you pledge is monthly (or per project), the perks continue, and the posts keep coming. It’s an ongoing journey! Missing Haruka is my original manga series, which I update every other Friday on Tapas. It follows the story of Haruka, whose curiosity lands her in a dubious facility from which no one has ever escaped. She must adapt to her new life, enduring experiments and training alongside nine others, and find a way out before something goes wrong. 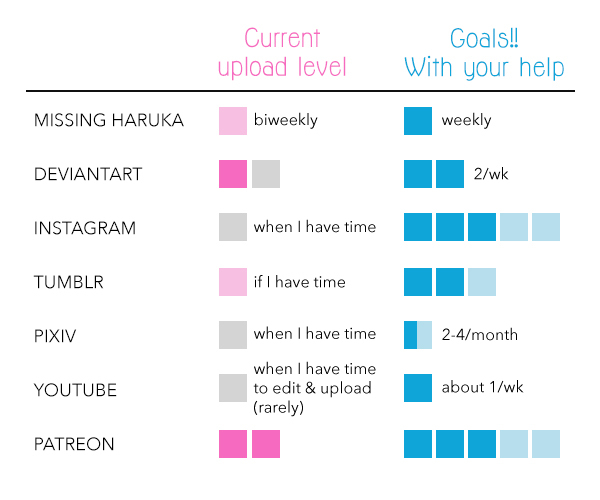 If you like my work, or just like manga in general, supporting me on Patreon will not only allow me to continue creating Missing Haruka, but also to increase my output, which means more art more often! If you’re a fellow artist or creator, or Japanese language learner, your support will also help me to help you! Because as I grow, I want you to grow. 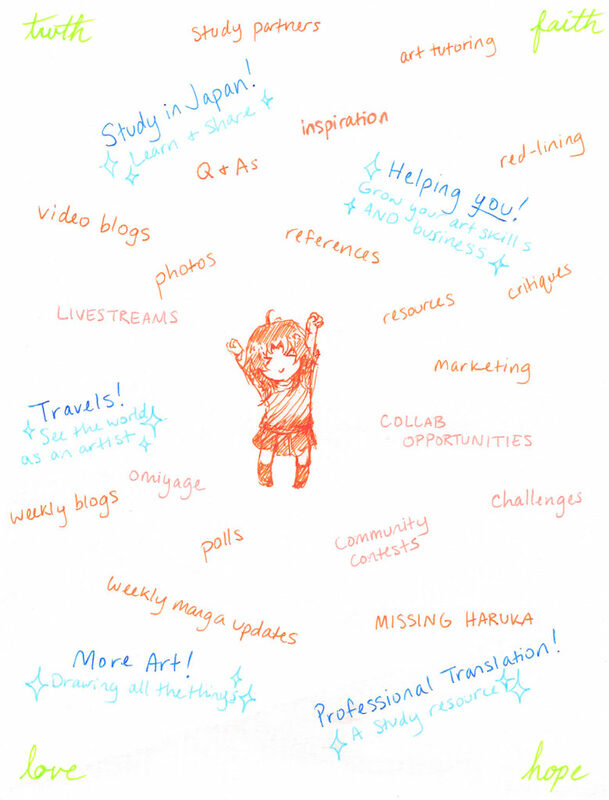 The little drawing I made above shows what kind of place I want my Patreon to be. If you want in on this, please join! For as little as $1 per month, you can get access to a wide range of perks, rewards, and opportunities. 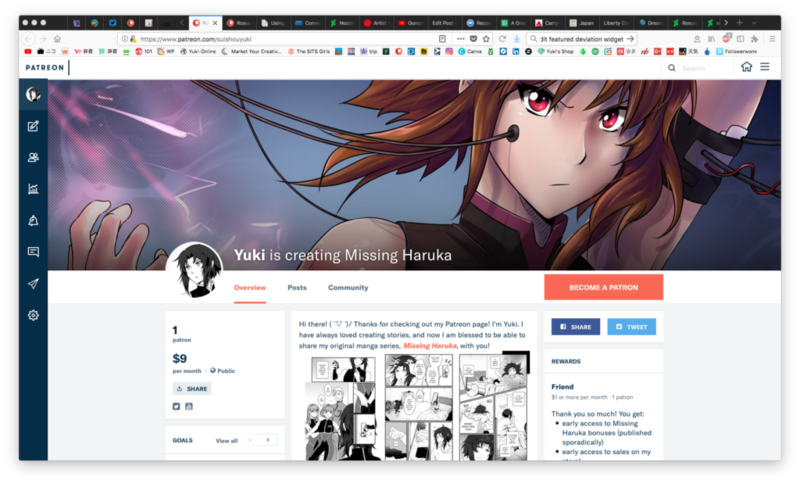 Posted in BlogTagged art, artist, creative, creator, japan, japanese, mangaka, missing haruka, patreonLeave a Comment on Join Me on Patreon and Support Missing Haruka!